It’s the big day and your flight is leaving soon. Looming catastrophic thoughts are already popping up. Your fear of flying is going to make this journey hell... But you have to get on that plane. How are you going to get through the flight? Luckily for you, I have some quick and easy fear of flying tips to relieve your anxiety (ones that don’t include drinking three glasses of wine.) Yes, even if it’s super last minute and you’re leaving today! As an ex-fearful flyer, I relied on this “bag of tricks” on more than one occasion. What’s amazing about these tips is that there’s almost no prep involved, so they are perfect for when you’re in a pinch. I should mention that if you’re serious about truly eliminating your fear of flying once and for all, you’ll need to use this formula. But in the meantime use these 5 “last-minute fear of flying tips” if you’re in a bind and pressed for time! Choosing where you sit on the plane can greatly help in reducing flight anxiety. And don’t worry if it’s last minute, you can still pre-select seats online even on the day of your flight. And if you come early enough sometimes even at the check-in counter at the airport. So which seats are the best? The answer depends on what sets off your anxiety. If turbulence sets you off, then you want to choose seats located directly over the wings of the aircraft. You’ll get a much smoother ride sitting over the wings because it puts you closer to the center of the plane’s mass. This area is subject to much less movement. compared to the seats near the nose and back of the plane which experience the most motion. This is not to say that when the plane experiences turbulence you won’t feel any bumpiness, but you’ll feel it a lot less. Alternately, if loud and unexpected airplane noises are what makes you scared of flying, you’ll want to choose a seat at the front because it’s the quietest part of the aircraft. Note that the seat numbers change depending on the plane and airline. So to determine which seats are over the wing it's best to check the airline’s seat map. If you weren’t able to reserve a preassigned seat at the time of purchasing your ticket, you can still do this online right before your flight. Keep in mind that most airlines charge a small fee for online seat selection. You can also try your luck at the airline check-in counter the day of your flight. The odds of getting a preassigned seat are lower, but there’s still a chance you could get a seat in the area you want, especially if you’re flying alone. Just make sure to get to the airport as early as possible as these seats are usually the first to book up. And most importantly - don’t panic if you weren’t able to get the seats you wanted. Even though turbulence and airplane noises may trigger anxiety, they’re just a standard part of flight! Muster up some courage before your flight by spending a few minutes checking out the Flight Radar 24 website. This site is terrific because it shows you how many airplanes are in the sky right now in real time. At any moment, there are thousands of planes up in the air. When I checked the map just now, there were 15,500 planes en-route! How will this reduce your fear of flying? Having a visual representation of the huge number of airplanes mid-flight is eye-opening because it allows you to see how insignificant your flight experience truly is. Here is a fun fact: There are approximately 102,465 successful flights EVERY SINGLE DAY! And 35 MILLION successful flights EACH YEAR. Just take a moment to let that sink in! Imagine, every year millions of fearful flyers like you, get on planes, and safely make it to their destinations! A big mistake a lot of fearful flyers make is concealing their fear of flying from those around them. But there’s no need for you to suffer in silence. Your fear of flying is certainly nothing to be embarrassed about. Having support makes things much easier. First, tell the gate agent at the check-in counter that you’re a nervous flyer. Then once you’re on board tell the flight attendants. Ask to speak to the lead flight attendant as they’re usually the ones with the most experience. Explain that you are scared of flying and ask if they could “drop by” every once in awhile just to let you know that the flight is continuing as normal. And trust me, don’t be shy to ask, it’s part of the job and they will be happy to do it! Flight attendants (especially the senior ones) are used to providing moral support to nervous passengers. As a flight attendant, I would make sure to check in with any fearful flyers numerous times throughout the flight, and so many of them told me how much this helped to ease their nerves. Also, don’t forget about your seatmates. Give them a little heads up that you’re a bit nervous and you’ll be surprised at how many people are understanding and willing to offer some kind words of encouragement. Just the act of speaking about your fear, releases bottled up tension helping you relax. Also, speaking with those around you helps keep you connected with reality and away from your imagination (more on this later). Have you heard the saying “an idle mind is the devil’s playground”? When we fly there can be hours when we're not doing anything. During these idle times is when we begin to notice all the “frightening sounds and sensations.” It’s also when our disastrous thoughts kick in, and we start obsessing about all the things that could go wrong. Years ago, when I first started working as a flight attendant, my fear of flying had gone away to the point that I could fly pretty comfortably. But every once in a blue moon there were odd moments when I would get a bit nervous on a flight, this was almost always when I had finished all the tasks at hand and was idle. I noticed that this feeling of anxiousness would disappear as soon as it was time for water service, or to prepare the next meal in the galley. This happened every single time and like the flick of a magic switch — my anxiety would completely disappear. By being busy I had no time to be afraid. Mentally occupying myself helped redirect my anxiety which in turn helped me relax. I’ve also used this trick when I fly as a passenger and it works just as well. The only difference is as a passenger you have to be proactive about keeping busy. So what are some ways to occupy your mind when flying? 2 easy ways are working and entertaining yourself. Make sure to pick the type of work that is engaging. Personally, I try to pick the type of work that is enjoyable and challenging - that way I really get into it and even forget where I am. Use any activity that keeps your mind active; The bottom line is to get creative! Just make sure it’s an activity doesn’t trigger more anxiety. Another way to stop anxious thoughts is to use good old-fashioned entertainment to distract yourself. Now’s the time to indulge in guilty pleasures like binge-watching reality TV shows, movies, and even those gossip magazines that you might not usually buy. Allowing yourself to get immersed in the dramas of other people’s lives is a great way to step away from fearful thoughts and momentarily forget about the flight. Because not all airlines include in-flight entertainment, make sure to be prepared. Before I fly I usually download a ton of movies, T.V. shows, and audiobooks so that I’m well stocked up. If you start to panic, talk to the people sitting beside you. Compare your version of what’s happening with what they are experiencing. Because when we’re frightened we can get caught up in a web of catastrophic thoughts and our mind can start playing tricks on us. Every sight, sound, and movement can seem like a sign that something is not right, and that everyone on the flight is doomed. The distinction between reality and our thoughts can become blurry as our disastrous thoughts take on a life of their own. We believe the stories that we are telling ourselves about what’s happening even if our perception is far detached from the reality of the situation. In order to snap out of this, start by questioning yourself and stay objective. Do not simply accept your thoughts as being correct. Speak to your seatmate and cross check with them. Often their experience is completely different from ours. Getting a fresh perspective on the situation, can stop the cycle of fear-driven obsessive thinking, and anchor you back to reality. Getting to your destination doesn’t have to be a nightmare to be endured. There are ways to ease the pain. In a perfect world, we would make use of all the resources available to rid ourselves of our fear of flying altogether. But, let’s face it, sometimes life gets in the way and we just haven’t gotten around to it. Having a handful of last-minute tricks to use on the day of your flight can make all the difference. Starting with getting to the airport early so that you can request a seat near the front of the plane to minimize sound, or near the wings to lessen the motion of turbulence. And then using reassuring online tools like Flightradar24 while you’re waiting in the boarding area. Concealing your fear of flying will only make it worse. So try not hide your flight anxiety. Talk to airline staff and fellow passengers and you’ll be doing yourself a big favor. Compare your experience with someone else's, and escape from the cycle of fear. Finally, keep your attention focused on either work or entertaining things so you’re not fixating on frightening thoughts! 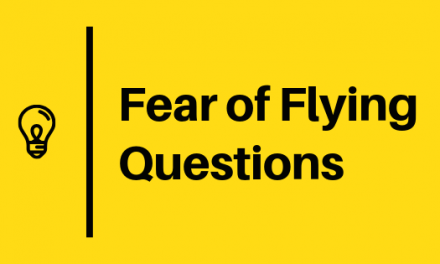 What’s your best fear of flying tip? What are the Odds of Dying in a Plane Crash?